BathBliss Goat Milk Soap - 3.5 oz. MoonMaid's luxurious goat milk soap!! Super sudsy which makes it great for shaving legs, faces, and underarms. 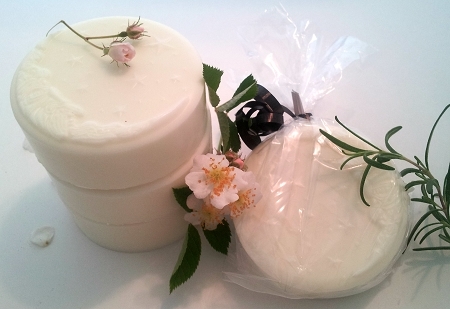 Leaves skin soft and smelling fantastic with our secret blend of essential oils and flower essences. Save when you buy a 3 or a 6 pack of this soap. Store extra soap in a dry bag. Don't let it get directly under the "flow" of water in the shower. It is a customer favorite and used by me daily!!! I love these soaps. They smell fabulous and are very creamy. This soap is the best. I use for my face and bath. It smells wonderful. And is very softening.